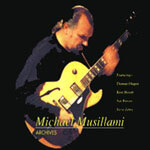 The first of three early 90’s collections of guitarist/composer Michael Musillami’s original compositions for larger all-star combos, all featuring the late Thomas Chapin. [Chapin] plays with a beautiful lyricism and respect for the composition. Musillami for his part can burn or play a ballad like ‘Emmett Spencer’ with complete tranquility.